It has been solid fishing in the area, and the Missoula Fishing Report for the week ahead looks to be a good one. River levels are still well above average for this time of year, but they are stable to dropping right now. With the weather that is on tap that should remain the story for the rest of this week. 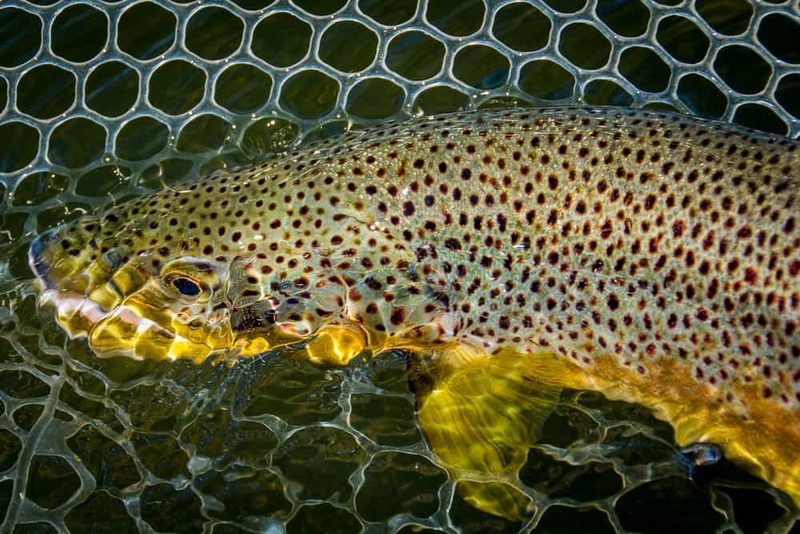 The Bitterroot is still the star of the show at the moment with clear flows and your best bet at dry fly fishing. In the past week we saw good Skwala dry fly fishing from the upper reaches around Darby all the way into Missoula. March browns, grey drakes, and blue-wings can be found on cloudy days and we have found a few fussy trout that would only rise to a mayfly. At times the river has been busy. The extra water this year helps but you still need to choose your floats wisely, especially on the weekends. Spring is your best chance at a really big trout on a dry fly and it looks like we will have at least another week of favorable conditions. Some other fishing options are starting to pop up as well. The upper and lower reaches of the Clark Fork showed signs of life in recent days. It’s still a little early for prime time on this river, but fishing was respectable and you are certain to see a lot fewer people than on the Bitterroot. We had moments of great dry fly fishing, but dry/dropper was the norm. If the rivers stay in shape then the Clark Fork will only get better as spring progresses. The Blackfoot is still mainly a nymphing game with tricky access in spots. If you are looking for a big fish and only need a handful of opportunities, you will find plenty of solitude on the Blackfoot. Wade anglers have seen plenty of success on Rock Creek. Dry flies, dry/dropper, nymphing, and streamer fishing has also produced bent rods over the last week on Rock Creek. The road is passable all the way through so there is plenty of water to choose from. Fishing in Missoula has been plenty good so far this spring and we are excited to get back on the water again this week! We put this together last year around this time. March Madness has a whole different meaning when you are in Missoula, Montana! 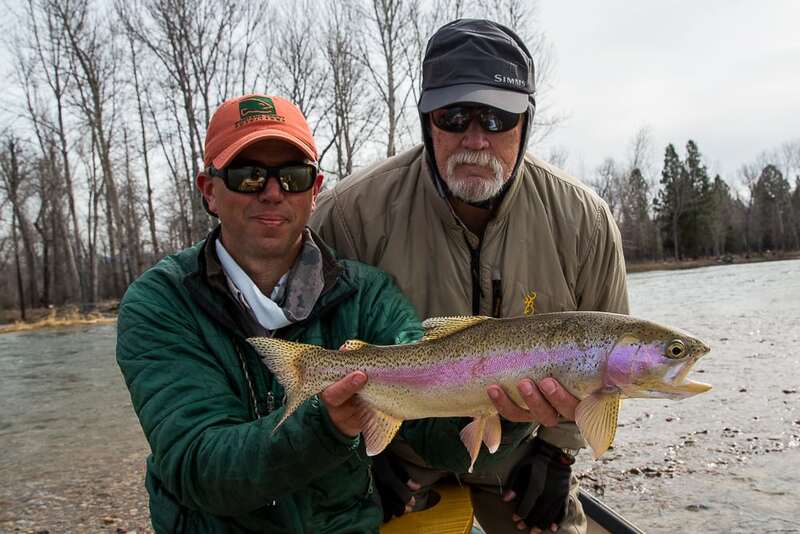 The Missoula fishing report for this week is one of challenging conditions. We are looking at record high flows for this time of year on the Bitterroot, and while it is our best option right now in the area it is still day to day on whether or not it is fishable. The other rivers around Missoula are blown out currently. 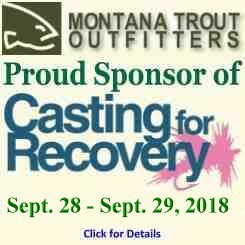 If you happen to be reading this Missoula fishing report and considering floating the Bitterroot on your own in the next few days then you need to make sure you are an experienced rower and reach out to fly shops, shuttle drivers, and guides to find out about any hazards on the river. The Root is NOT for the inexperienced right now. There are blocked channels, nasty hydraulic currents, dangerous diversion dams, and even sketchy boat ramps at the moment. With almost 20 years on the river I have had a couple heart pounding moments in the last week, and no trout is worth risking your safety over. The current conditions have made it a nymphing game mainly. A couple nymphs under an indicator fished in the right water will produce right now. There’s not much of a dry fly game at this point. If you hunt the back waters and side channels with a skwala you can raise a few fish, but if you are looking for action then it’s a stonefly nymph and san juan in the slow water. We are at the mercy of the stream flow gauge this March. If the river stays level or drops then the dry fly fishing will begin to kick in. If the flows continue to bump up and down then a strike indicator will be your new best friend. Skwala fishing is always a bit of a gamble. 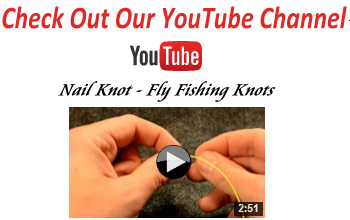 There are some big trout hitting the net daily if you’re willing to take the risk. Another 6″ of fresh snow overnight and it is still coming down as it seems winter will never end here in Missoula. March has certainly come in like a lion this year and we can only hope that it goes out like a lamb. This latest storm will certainly push the area over 100% for snow pack. With a couple more wet months ahead of us all signs point to a great water year in 2017. You can see for yourself right HERE. In the meantime Missoula fly fishing guides are starting to get restless. Yes, there are a few fish to be caught right now in these winter conditions, but the hatch isn’t making much progress forward. We are holding onto the hope that next week’s forecast is correct. If the forecast holds true, we should see daytime highs in the mid to upper 40’s and lows at or above freezing. That’s a good recipe to get those Skwala nymphs migrating into the shallows, and next week could be the break we’ve been looking for. I don’t expect dry fly pandemonium although it should get some trout looking toward the surface in the right spots. For the moment we will continue to tie flies and drink beer to keep us sane. Fingers are crossed that the weather forecast is more accurate than normal. 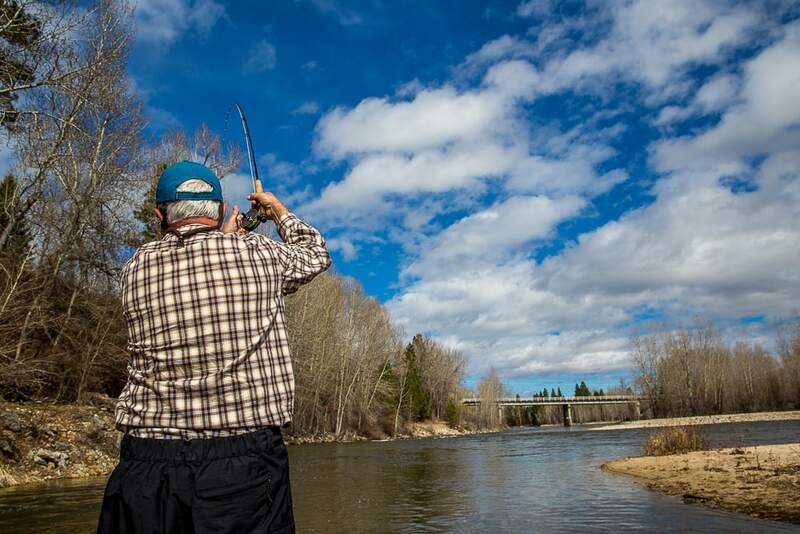 March 1st marks the start of a new license year for anglers in Montana. That means you need to pick up a 2017 Montana fishing license before you head out to the stream or lake next time. You can buy your license the old fashioned way, in person at a sporting goods store, fly shop, or FWP office or you can go on-line to MT FWP and purchase and print your license from home. You can even keep a pdf copy of your license on your phone this year that qualifies as proof of license should you get checked by a game warden. Despite the new license year upon us, there aren’t many anglers out fly fishing on local streams. 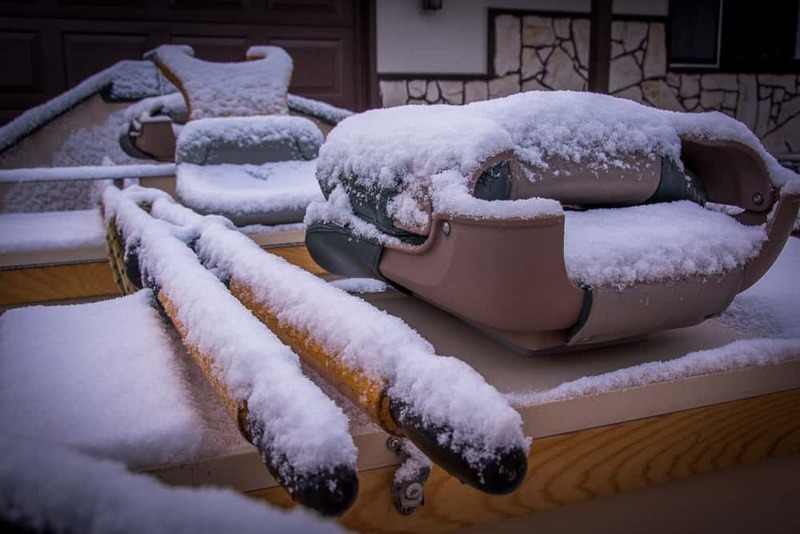 The recent cold and snowy weather has kept all but the most hard-core hunkered down at home, or up at the ski hills. You can catch some trout in these conditions, but don’t expect banner fishing. The water temps are still a little too cold for good insect activity and the fish are sluggish. It is a noticeable change from last season when there were boats rolling around town by mid-February and pretty respectable fishing on this date in 2016. We are well behind that schedule this year which might hamper our early season a little, but it bodes well for the rest of 2017 with lots of high and mid-elevation snow still on the ground. Look for the Bitterroot and Rock Creek to offer the best action once we see the next batch of warm weather. A day or two of temps in the 40’s is all it will take to get the ball rolling and start our fishing season. Nymphs and slow streamers will be the best tactic for the foreseeable future, but the dry fly fishing will come. Mid-March is my guess for when the trout will start looking up and then it will only get better from there! Get your Montana fishing license now while it’s cold and snowy so you’ll be ready when the fishing does heat up.